It never fails, you go to a brewery and enjoy a new brew. Sip by sip your palette is evolving, and you are falling in love with the perfectly carbonated draft beer. That’s how it always happens with my husband and me anyways. We’re big fans of craft beer, but whenever we get a growler or a six-pack to bring home, it just doesn’t taste as good as it did coming out of the brewer’s tap. Fizzics draft beer systems have set out to fix this problem. You can enjoy draft beer at home the way brewers intended it to be enjoyed thanks to this home beer tap. Works with all beer styles including IPAs, stouts, pilsners, lagers, etc. Great for outdoor activities, camping, tailgating, etc. Watch the video below to see how simple it is to clean your Fizzics system. Is there another product for sale like Fizzics? Not really. The most comparable is a Kegerator, which is a combination of a keg and refrigerator. What’s the downside of a Kegerator? These can cost more than $4,000 depending on the model you purchase. Kegerators also take up more space and have recurring costs associated with them, like CO2 and cleaning kits. Do you like experimenting with different gadgets and trying new brews? 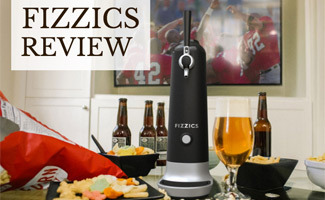 Fizzics may be a great addition to your at home bar. Fizzics is easy to travel with and less expensive than the competition. We’re confident that if you have Fizzics out at your next BBQ or tailgate it’ll start up some chatter. What do you think of Fizzics? Is it gimmicky or life-changing? This is amazing, I must get one of thezzze!! !